I'm going to need to do some major catching up this week as this past weekend saw the release of three new wide releases and the expansion of another. 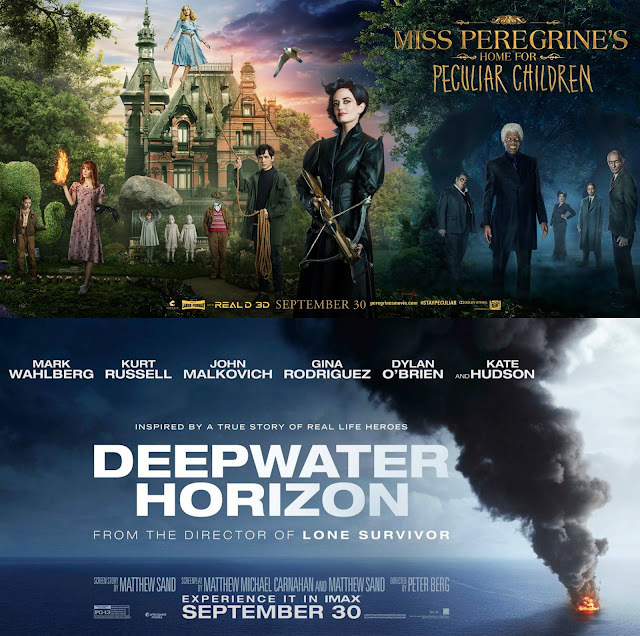 It seemed only two of these will end up mattering in the long run as the Tim Burton adaptation of Ransom Riggs' best-seller, Miss Peregrines Home for Peculiar Children, ended up atop the weekend box office while the Lone Survivor reunion of director Peter Berg and star Mark Wahlberg in Deepwater Horizon finished second. The other films referenced to are the long-delayed Jared Hess (Napoleon Dynamite) comedy Masterminds and the based on a true story inspiration Disney flick Queen of Katwe. Both of these films have rather stellar casts considering their genres with Zach Galifianakis, Kristen Wiig, Owen Wilson, Jason Sudeikis, Kate McKinnon, and Leslie Jones all starring in Hess' take of one of the biggest bank heists in American history while Lupita Nyong'o and David Oyelowo headlined the account of a Ugandan girl who sees her world rapidly change after being introduced to the game of chess. While I was hoping for something unexpected from Masterminds it was critically panned and only earned an estimated $6.6 million from 3,042 theaters. Queen of Katwe couldn't do any better in its first weekend of wide release making only $2.6 million from 1,242 theaters. It was Miss Peregrine who reigned supreme with an estimated $28.5 million from 3,522 theaters. The film also received a "B+" CinemaScore with audiences under twenty-five giving it an "A-" which bodes well for the YA property in the coming weeks. Deepwater Horizon finished second with an estimated $20.6 million from 3,259 theaters and also scored an "A-" CinemaScore. Filling out the remainder of the top five were holdovers The Magnificent Seven as well as Sully which continues to do impressive numbers. Thanks again to Jordan Mears for filling in for me this weekend and, as always, be sure to follow us on Instagram, Twitter, and subscribe to our YouTube channel as we have a new review (or reviews) up each week!